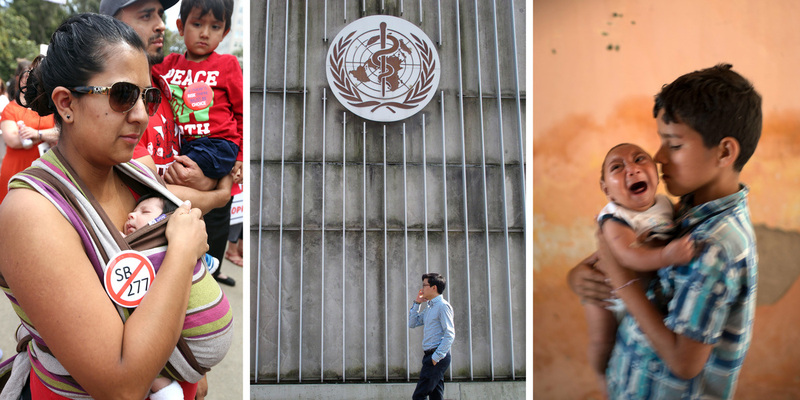 Global Health Experts Predict The Big Stories Of 2016, From Polio To Zika : Goats and Soda What will be the big stories of 2016? Four experts offer their best guesses. They worry about Zika virus and malaria. But not all their predictions are downers. No one predicted the Ebola epidemic before it burst forth in 2014 and continued to claim lives throughout 2015. And so, as 2016 begins, readers might well wonder what biological culprits — parasites, bacteria and viruses — are lurking out there, ready to unleash another outbreak of something terrible on an unsuspecting world. We put the question to four infectious disease experts: What are your best educated guesses about the big global health stories in 2016? Before making any predictions, Dr. Dyann Wirth, chair of the Department of Immunology and Infectious Diseases at the Harvard School of Public Health, wanted to take an optimistic look back. Three researchers shared the 2015 Nobel Prize in Physiology or Medicine for their work in discovering treatments for malaria, river blindness and lymphatic filariasis, also known as elephantiasis. "We're at a very interesting time in global health," says Wirth. "That these diseases were recognized by the Nobel Committee raised awareness in the public eye." In the future, relatively unheard-of diseases could emerge from the shadows. Some experts are already looking suspiciously at a mosquito-borne culprit that had been a relatively small player in global health but is now alarming health officials in Brazil — the Zika virus. The incidence of Zika infection has been low but has shown signs of increase in South America and other areas of the world. And in November, chilling reports out of Brazil have health experts worried that the Zika virus might be connected to an upsurge in microcephaly in infants — a condition in which the infant's brain is smaller and less developed than normal. "This virus might be causing birth defects in Brazil," says Dr. Michele Barry, dean of Global Health and director of the Center for Innovation in Global Health at Stanford University. More research is needed, but similar reports of increased Zika virus coinciding with increases in brain and spine malformations in French Polynesia have health officials worried. A challenge in 2016 will be to hold on to hard-won health advances in an unstable world. For example, Wirth said, during the Ebola crisis, malaria treatment fell lower on the priorities list in the affected countries and fewer protective bed nets were available. The result was a rebound in cases of malaria. One study estimated the number of cases of and deaths from malaria in Guinea, Liberia and Sierra Leone. The study found a probable increase of 3.5 million malaria cases in those three countries during the Ebola epidemic, resulting in 10,900 additional deaths. Disease doesn't respect borders, and cross-border infection of malaria is a big problem in Africa, says Dr. Peter Agre, director of the Johns Hopkins Malaria Research Institute and a Nobelist in chemistry in 2003. "It's like crab grass. You can take care of it, but if your neighbor doesn't, it comes right back," says Agre. Factors having nothing to do with health-care systems can be at play in disease spread: chaos, war, natural disasters, economic downturns and refugees on the move. "In sub-Saharan Africa, malaria, HIV and TB could be rapidly re-established," says Agre. Past progress can be fragile. "It's possible we could have a re-emergence of Ebola. Ebola and SARS and avian flu have taught us that we have to be prepared for the unknown, for epidemics from an agent we haven't precisely seen before, or we didn't anticipate as having a huge impact," says Wirth. She remembers being on a scientific panel about a decade ago when the topic of Ebola came up. "One expert said that it was an irrelevant disease. That's the kind of attitude we have to guard against. Perhaps Lassa fever [a viral illness transmitted by rats, seen in West Africa] or chikungunya virus [an infection transmitted by mosquitoes] could lead to a pandemic," says Wirth. The world health community needs a cadre of people busy cultivating a base of knowledge of diseases like Zika virus so that the world health community can react quickly to new threats and cultivate a base of knowledge to help the world act quickly. That didn't happen with Ebola. "The people working on Ebola before the outbreak — you could probably count them on one hand," says Wirth. Fortunately, that's not the case today when it comes to avian flu researchers. "There has been a constant interest in understanding how the influenza virus moves between species," says Wirth. "Should something happen, that group of people is prepared." But for a lot of other potential outbreaks, the world needs to be better prepared than it has in the past, says Barry. So for her, the big health story of 2016, Barry predicted, will be the reorganization of the World Health Organization. "The WHO is broken," she says. "They felt they were just a technical adviser [on Ebola] and waited eight months to call a public health emergency. They weren't ready to roll out vaccines or drug trials. They were not prepared to ramp up experts and medical volunteers." The WHO has been publicly shamed over its response to Ebola, says Dr. William Moss, head of epidemiology at the International Vaccine Access Center at Johns Hopkins University. "There were critical reports of their response. What the world needs is an organization that's going to step up and take a leadership role," he says. "I think the WHO learned, and the next time this happens, the global health community will be better prepared." WHO itself acknowledged shortcomings and has drafted recommendations for change. No one knows for certain what the next global health challenge will be. Moss says the U.S. will probably have additional outbreaks of measles because of some parental resistance to vaccines. And advances in infectious disease and in maternal and child health are new and fragile and could suffer setbacks. "I'm going to be an optimist and say the big public health story of 2016 will be the last case of polio in the world," Moss says.